The National Resources and Defense Council in partnership with David Gardiner & Associates published the 6th edition of the Fighting Oil Addition: Ranking States’ Gasoline Price Vulnerability and Solutions for Change report last month. 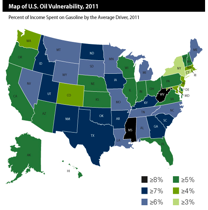 The study identifies those states whose citizens are most impacted by gasoline prices as well as states that are doing the most to break their oil addiction. The report uses two indicators to provide state rankings, gasoline price vulnerability, and adoption of smart solutions to reduce oil dependence. Among its conclusions, the research finds that few states are taking significant steps to reduce oil dependence. To read the report in its entirety, visit http://bit.ly/NRDC6thFOA.